Please oh please let this be matte and not glossy. Please. I don't ask for much. You took the words out of my mouth. This layout is so refreshingly clean and simple. If it is glossy we could all scuff up copies in our local stores. The author may thank us because otherwise it is a thing of beauty. I'm not sure if this is the place to comment on the book and book review itself (as opposed to the cover - which is not glossy and is beautiful), but I just read The River of Lost Footsteps as well as William Grime's review and I think Grime's kind of missed a big part of the book. 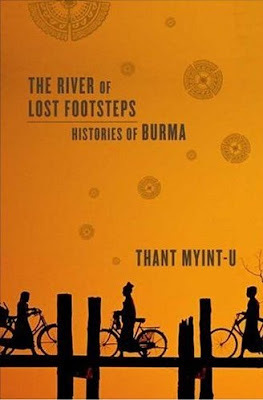 I think it's an excellent introduction to Burma and enjoyed reading it very much. And unlike Grimes, who thought the 'back story' was not handled well, I thought this was a major strength of the book. Perhaps he's not familiar with Asian history but I found that this is the very first book that places Burmese history in an international setting, linking Burmese events with events in Mughal India, Ming China, the ancient silk routes, Iberian explorers, etc in a way that was both scholarly and entertaining. I ran across this at the bookstore today. The paper isn't matte in the sense of being uncoated, say. It's got kind of a satin finish to it, but not shiny. I bought this book because I saw your post here with the cover (satin-y, not matte or gloss). It is beautiful! And so far I'm very much enjoying the book itself. I guess this would make me a "buy a book because of the cover" kind of guy...on this one, anyway.